Hailing from Jackson, Mississippi, Harmon spent a number of years playing with soul-blues artists like Z.Z. Hill and Dorothy Moore when they toured the South. In the 1980s he moved to Los Angeles where he became a studio fixture. He developed his talents and made some great connections, but it wasn’t until 2002 that he launched his blues career with Live at Babe and Ricky’s Inn. Since then he has released a handful of albums on independent labels, including the well received From the Root in 2009. Harmon’s soul-blues style is a throwback to the post-World War II era in the South when African American musicians blended familiar blues forms with the popular rhythm & blues sounds popular in the North. 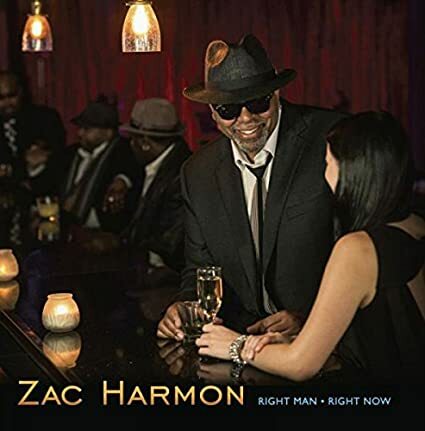 Many of its champions, such as Hill and Bobby “Blue” Bland have passed on, leaving a handful of younger performers like Harmon to carry the torch. Harmon’s Right Man Right Now includes some excellent musicianship and vocals, reminiscent of Robert Cray. Harmon, a guitar player and organist, has put together a well-crafted album, including the rousing opener, “Raising Hell,” with organ and guitar contributions from guest artists Lucky Peterson and Anson Funderburgh, and the funky “Hump in Your Back.” But a few songs, such as “Stand Your Ground” and “Back of the Yards,” extend beyond standard blues music themes to touch on Harmon’s heartfelt concerns about social justice, taking the blues form back to where it started – as an outlet for expression about challenging living conditions (and echoing the social commentary of bands like Michael Hill’s Blues Mob). Harmon’s band includes Buthel on bass guitar, Cedric Goodman on drums and Cory Lacy on keyboards. In addition to Peterson and Funderburgh, Bobby Rush guested on vocals and harmonica and Mike Finnigan on organ.